A paradise in the Philippines, Palawan’s charm lies in its surrounding waters. The archipelago is made up of the main Palawan island and smaller surrounding islands which are all encompassed by a breathtaking underwater landscape. Rich in coral forests and marine life as well as pristine soft sandy beaches and lush, tropical jungle interiors, Palawan is asking to be explored. Diverse in cultures, history, and rich with delicious foods, Palawan is what could be called perfection. The island’s jaw-dropping scenery is quickly becoming popular with intrepid tourists, keen to holiday in the heavenly surroundings, dive in translucent turquoise water and trek in the depths of rainforests. The island is yet to see overt tourism and development, with a handful of luxury resorts setting up in secluded spots, the main places to stay in Palawan are locally run lodging with unbeatable beach views at affordable prices. Palawan is one of Southeast Asia’s untrodden gems, which is quickly becoming the fashionable arcadia. Uncover hidden lagoons, dine on fresh fish at beachside restaurants and soak up sublime sunsets as the days slowly slip by. There’s a spot on one those blissed out beaches waiting for you: it’s time to discover the sublime. Situated in the beautiful Bacuit Bay on the north of the island is the stunning El Nido. It’s perfect for travelers who want to take some time out; think young couples on honeymoon or backpackers looking for some serenity. The surrounding seascape is picture postcard perfect with sparkling waters, soaring cliffs and pure sand. The town of El Nido’s remoteness makes for a restful island getaway, with its lovely little restaurants that line the beach where you can enjoy tasty food and people-watch. El Nido is all about its location: use it as a jumping-off point for island life, organize a day trip to the surrounding landscape, spend the day enjoying yourself at a boat party, or luxuriate in one of the secret lagoons. 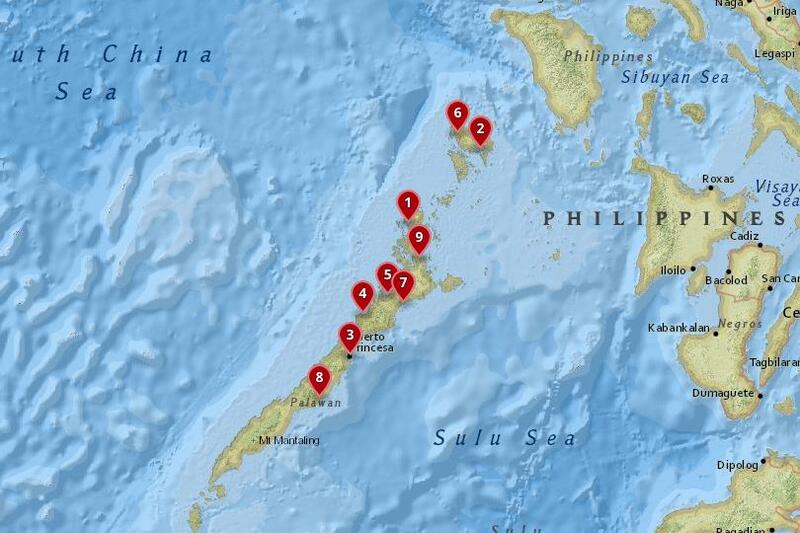 You can even try out some of the best diving spots in the world. Accommodation is varied and there are basic budget options available in the form of guest houses and lodges, but accommodation here is dominated by luxury hotel complexes which offer 5-star stays, private jetties and isolated beaches. Matinloc Resort – Put simply, this 4-star resort is a lovely place to stay. There’s a wide array of rooms to choose from, all tastefully decorated and with considered design touches. Some of the rooms are very private since they’re tucked away on the mountainside amongst trees; all of them are connected by wooden walkways. Balconies here look right across treetops and over the sea. Try your hand at table tennis, get a book from the library, enjoy a la carte meals at the restaurant, or simply get room service! 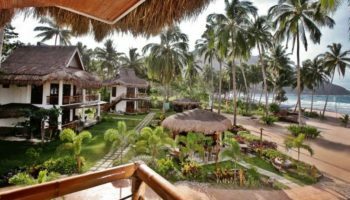 El Nido Coco Resort – Simplistic luxury is what best describes El Nido Coco Resort, plus authentic touches of Filipino life, of course. Rooms come with thatched roofs, stylish contemporary interiors with beautiful and minimalistic touches, and their own private terraces. If you’re looking for a real break away from the hustle and bustle of life, this is the place to do it. Close to the beach, but also only 10 minutes away from town, at this hotel you’re never too far away from whatever you feel like doing. The Nest El Nido Beach Resort – Situated right on the beach, The Nest is the place to go for beach lovers and those who love sea-based activities. The stye of the rooms here is traditional mixed with a spacious sense of luxury, with white walls and dark wood, plus televisions and a minibar. There’s a great restaurant on site, which comes complete with beautiful sea views. They can also provide delicious cocktails which will definitely keep you coming back for more. The staff here can arrange tours around the lagoons for you, as well as relaxing massages. 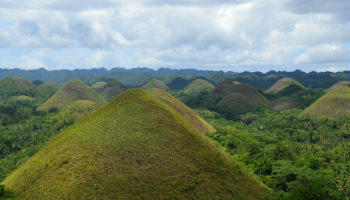 The breathtaking and totally captivating Coron sits in the northern point of Palawan province and is a peaceful paradise surrounded by overflowing reefs, deep blue lagoons and steep limestone formations. Think James Bond island retreat and you might be somewhere near the idyllic setting of Coron. Its karst landscape juts jagged out of the turquoise seas in a majestic natural sculpture, which is part of what makes this place a favorite for anybody who visits.The tropical nature is easily accessible and life is laid-back and chilled-out. 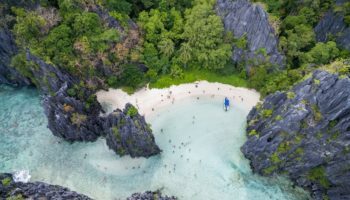 Coron, which boasts fresh produce at its vibrant market, is a quick drive from Busuanga airport and then a speedy boat ride to the island, where you’ll get totally washed away with its beauty. Coron is home to trendy budget hostels and midrange modern hotels, but there’s also a selection of international hotels offering luxury accommodation at a luxury price. Two Seasons Coron Bayside Hotel – The Two Seasons Coron Bayside Hotel is an impressive place, set in chic modern buildings that overlook the sea. Top quality dining is to be had in their restaurant, complete with mesmerising jellyfish-inspired chandeliers. There’s an incredible infinity pool that looks out across the bay and the islands, where it’s easy to do nothing except lap up the luxurious atmosphere. 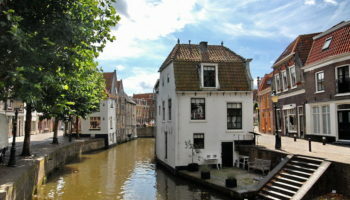 The town is only a 10-minute ride away by local transport. The Funny Lion – Featuring minimal design that lets the stunning natural scenery do all the talking, The Funny Lion is a beautiful slice of luxury. The outdoor pool has views across the treetops, whilst the hot tub looks out onto a stunning vista of the sea. This place is most certainly sophisticated, and it comes with excellent service to match, with staff always on hand to answer any questions you might have, or book you a tour. Coron Public Market is nearby for a slice of local life. Discovery Island Resort and Dive Center – A stone’s throw away from the beach, this is a peaceful and private place to have your very own island getaway. The Discovery Island Resort oozes a relaxed ambience, perfect for creating the mood for the ultimate chill-out. Located on its own island just a five-minute boat ride from Coron Town itself, you’ll certainly feel exclusive here. The rooms at this 3-star offering have a simple, pared back style, plus there’s an outdoor pool to enjoy here as well. Most people who visit Palawan will fly into Puerto Princesa City and use it as a starting point to explore the rest of Palawan. There is more to the city than first meets the eye, and it is an interesting place to stop off for a few days and get yourself acquainted with Palawan life. The city is the only urbanized place on Palawan and is where the bulk of its people live, although the town itself isn’t packed with sights you still can use your time to take day-trips to Honda Bay and the beguiling Underground River – the longest subterranean river in the world. Hotels and hostels in the city are budget but are clean and have a fun atmosphere. 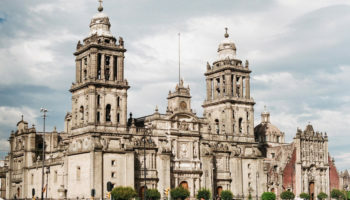 Take a walk around the streets or hire a cyclo driver to take a tour around the city; you can discover the local eateries and bars to really get under the skin of the capital. Hue Hotels and Resorts – With its vibrant decor and chic interior design, not to mention its very comfortable beds, this hotel is very clean and very well maintained. 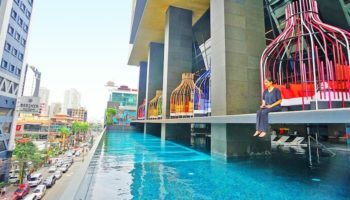 Staff look after you from start to finish at this hotel: you can arrange day trips from the comprehensive tours desk, or you can simply unwind with skyline views whilst taking a dip in the rooftop pool. This place also comes complete with its own airport shuttle, which is always handy. Best Western Plus The Ivywall Hotel – This 4-star hotel is a shiny, modern and classy place to stay. The decor is a little bit of glitz and glamour in the city, for those who seek it. The airport is close, so getting to and from this iteration of Best Western Plus is easy. Nearby are two great restaurants, but the hotel itself serves food too, as well as their big, delicious breakfast which is included in room rates. Overall it’s a great place to stay if you’re looking for an elegant oasis in this busy city. Colors Boutique Hostel – Colorful, as the name might suggest, and friendly, this boutique hostel is close to Mendoza Park as well as the Palawan Museum, so it’s easy to explore the city from here. The owners are full of fun and passion for their work. It’s also quite close to the airport from Colors Boutique Hostel, which means it’s convenient if you need to catch a flight. Rooms are simple but clean, comfortable, and decorated in those all-important cheerful colours. This sociable hostel is a great place to be if you’d like to get to know your fellow guests. Deep Forest Garden Hotel – Surrounded by tropical gardens, this 3-star hotel is conveniently located: just five minutes from the beach and a 10-minute drive into town, meaning you’ll never feel too far from anywhere. The rooms are spacious and clean here, plus there’s a wonderful pool area to enjoy the serenity of the surrounding landscape. You can choose from a selection of rooms too, all of them furnished traditionally but with stylish contemporary touches. Air con and garden views come as standard. The small fishing village of Sabang is situated between slices of karst formations on one side and striking seascape on the other. The quaint and pretty town has seen increased visitors with the rise in popularity of the famous underground river which is accessed from Sabang. Sabang’s eye-catching natural ecology also attracts travelers – take a trip to the spectacular Sabang waterfall and hike among the hills, or simply sit on the beach in the soft sand. Get to Sabang by the regular local buses from El Nido or Puerto Princesa and stay in one of the many newly developed upper and mid-range hotels and resorts in the area; or for a backpacker budget, there are beach huts and homestays available. Daluyon Beach and Mountain Resort – This amazing place has sumptuous views of the West Philippine Sea, meaning you’ll be able to witness some pretty amazing sunsets from here. But that’s not all: Dayulon Beach and Mountain Resort is set quite literally on Sabang Beach itself, meaning beach fun is very close indeed. The rooms here evoke a modern twist on a traditional bungalow, and they’re quite luxurious, to say the least. The restaurant serves up Filipino and international cuisine. And after your meal, enjoy drinks at the bar with the amazing stars above. Sheridan Beach Resort – This branch of Sheridan is all about modern and clean rooms decorated in a contemporary style. It’s got a large outdoor pool, of course, with sun loungers and a dramatic mountainous backdrop. But there’s a lot more to this 4-star hotel than just that. In fact, it has everything you could need on site: a fitness centre, a spa, a beachfront restaurant, a bar, plus shops for essential items (and souvenirs). As for nearby sights, this place is just a 20-minute boat ride away from the captivating subterranean river. Port Barton is a small but attractive fishing village between El Nido and Palawan. Home to white sandy beaches that the area is so well known for, here you can spend a few days getting lost in the surf, indulging in the fresh local cuisine and snorkeling just off of the coast. Take a boat trip from the port to the magical area around the mangrove reserve where, with the help of a local guide, you might be able to spot some rare wildlife. The accommodation in the village is generally cheaper than that of El Nido, but you still get the same island getaway atmosphere and with the added bonus of a sandbar which appears at low tide and makes for a perfect spot for soaking up the sun. Rubin Resort – This 2-star offering with its thatched-roof huts might not be about luxury, but it’s certainly a down-to-earth and authentic stay, and just a two-minute stroll to the beach as well. There’s a pool to have fun in at Rubin Resort, plus every bungalow comes complete with its own terrace area, where you can relax with a drink. It may be budget friendly here, but it’s kept immaculately clean and the staff are very friendly. The island of Busuanga just off the north of Palawan has it all: idyllic beaches, stunning scenery and amazing diving in the nearby shipwrecks. The pristine wildlife remains relatively untouched and the land and seas seem to be bursting with exotic wildlife and plants. Its rivers and mangrove forest offer up opportunities to kayak or hike in the depths of tropical jungle terrain. 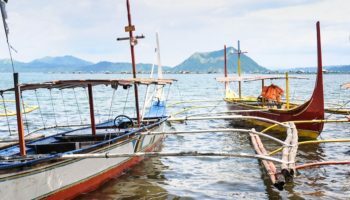 It’s easy to reach Busuanga from Manila as it’s so close, in fact hotels in Manila can supply tourists with fast boats to the island; or you can take a fishing boat from Coron. As the sun fades the sky comes alive with thousands of stars; Busuanga is a fantastic spot for a bit of stargazing. There are some budget beach huts to rest your head in, but a bit more cash will get you a spot in a diving resort hotel with a pool and higher standards. If you’re really looking to splash the cash, then you could opt for an exclusive resort on one of the tiny islands around Busuanga coast where you will get treated like royalty and supplied with everything you could want during your stay in paradise. Busuanga Bay Lodge – Tucked away in the southwestern part of Busuanga, this lodge is all about luxury living from start to finish. Begin with a musical greeting, continue with the amazing staff who’ll make sure your stay is the happiest and best it can be, and end with another musical send off. You can while away the hours here in the infinity pool (complete with views of the lagoon) and then eat some truly incredible fresh food at the restaurant. Spa and massage services are available here, too. La Estancia Busuanga – The resort of La Estancia has a lot to offer, from its own outdoor pool and barbecue area to its private slice of sand and an on-site restaurant. There’s also a shared lounge so, if you feel like it, you can get chatting to other guests in this little slice of luxury. Some rooms at this place come with incredible sea views, and others have mountain views. The staff here go over and above, offering a 5-star service at this 3-star hotel. 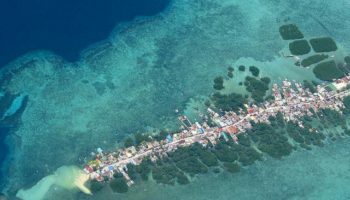 The small town of Roxas is often only a short stop-off for travelers, but stay a little longer and you may discover more about this small beach town. Roxas’ attraction comes in the form of its perfect paradise beach that will cure any regular traveler’s beach blindness, its lush jungle fauna and its pretty little port. 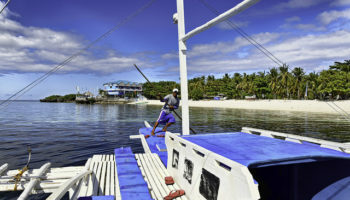 Offbeat and uncaring, Roxas allows for a glimpse into island life in the Philippines – browse the local shops and markets with the locals and watch as the boats tick in and out of the harbor. You can reach Roxas by bus from El Nido or the ferry from Manila and once you’re there rent a bicycle from a local shop and whizz around on two wheels; pedal further afield to the nearby waterfalls and jump in the cool water when you reach them. 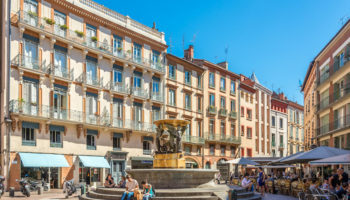 There isn’t a great deal of mid-range accommodation in the town, which mainly consists of guest houses or bed-and-breakfasts. Modessa Island Resort – Set on the private island of Modessa, spending time at this paradise beach resort is all about enjoying the surrounding scenery. That means scuba diving, snorkelling, or birdwatching. You name it, this place can offer it. Being on a private island means you’ll feel truly hidden away, living out your island getaway fantasies with the amazing food on offer at the resort, as well as the stunning views you’ll be able to enjoy from your own private cabin overlooking the sea. The small town of Narra is rich with scenic views and incredible biodiversity which draws visitors to explore the natural surroundings. The mountain ranges around Narra provide a habitat for incredible wildlife, whilst its mangroves, winding rivers and iconic waterfalls make for fantastic kayaking and hiking. Take a trip to the nearby Turtle Sanctuary which is a nesting site for green turtles. To get to Narra you can jump on a shuttle bus from Puerto Princesa and once you are there a stay in Narra not only means access to its depth of nature, but also a spot on the almost deserted beaches in the area – either on private island resorts or locally run basic guesthouses. Arena Island Resort – Just a minute from a slice of heavenly beach, Arena Island Resort is situated on its own private island. This secluded, exclusive feeling makes this hotel really seem like a true tropical retreat. Staff at this 4-star resort are very attentive indeed, and make sure you’re happy with your stay at all times. There is a range of activities going on here: you can turtle watch, stargaze with telescopes, go kayaking, or snorkeling. Plus you’ll be very well looked after at this place, that’s for sure. Taytay is an old town that was founded by the Spanish in 1623 and is home to an old fort that still stands today. What could be described as an unexplored paradise, Taytay is surrounded by arcadian islands that are waiting for you to discover them. Taytay itself is a few hours bus ride away from Puerto Princesa or El Nido, once there rest your head in one of a large selection of well priced accommodation on the island. Hire a boat to seek out the best snorkelling spots or try swimming in the secret lagoon or kayak at Lake Manguao. This is the Palawan paradise you have been searching for. Pems Pension and Restaurant – With its own restaurant and garden, as well as a chilled terrace bar, Pems Pension is great for those on a budget. But budget prices don’t mean budget service – the staff here are absolutely great; very helpful and friendly. The food in the restaurant is delicious, too. As for the rooms, these are rustic beach-style bungalows, but they’re clean and well maintained. Plus each one has its own little terrace so you can relax in the surrounding nature. This hotel is a good base for a day trip to El Nido Peninsula. We want to know various tour packages for visiting Palawan for 3 days and 2 nights with 4 adults travelers from Manila this coming December 1 to 20, 2018.